Not quite sure what a “Mass Mob” is? 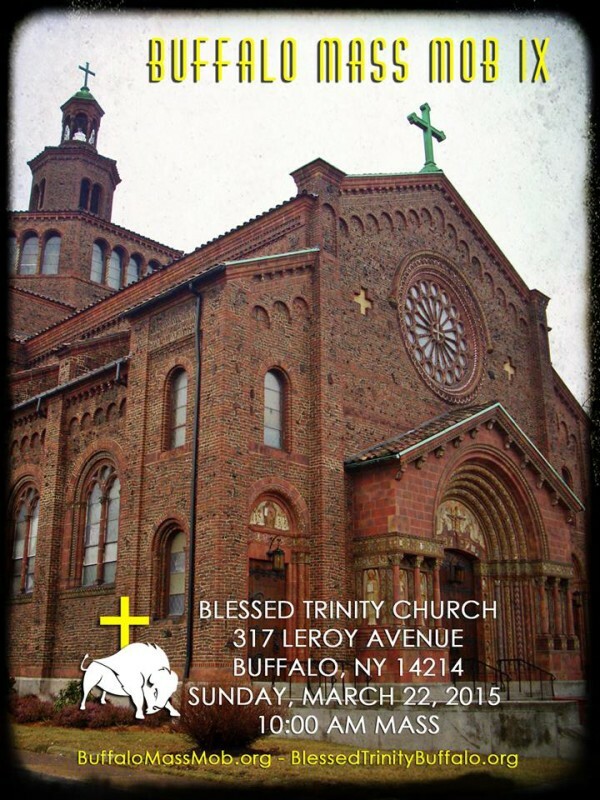 It is simply an invitation extended via social media “to support and experience some of Buffalo’s wonderful churches….” The idea sprang from the successful Buffalo Cash Mob, which was an attempt to support locally owned businesses by encouraging people to shop there on a given weekend. The first Mass Mob took place at St. Adalbert Basilica in November 2013. Since then, the Mass Mob has visited seven city churches from South Buffalo to Black Rock. Blessed Trinity will be the site of Mass Mob IX on Sunday, March 22. Still not sure you want to be involved? A spokesperson for Holy Angels Church on Buffalo’s West Side described Mass Mob VII as “a great experience from start to finish.” We’ll add more details about our plans for the day as they become available, but please plan to join us for worship on Sunday, March 22, at 10:00 a.m.
For those of you who attended Mass Mob VIII at St. Casimir, you will surely want to follow-up with Mass Mob IX. Like St. Casimir, the architect for Blessed Trinity was also Chester Oakley (along with Albert Schallmo) . Both buildings were under construction at the same time, St. Casimir being completed in 1926 and Blessed Trinity in 1928. The latter is considered the purest replication of 12th century Lombard-Romanesque architecture in the United States. To read more about the outstanding architectural features of our Landmark edifice, Click HERE.